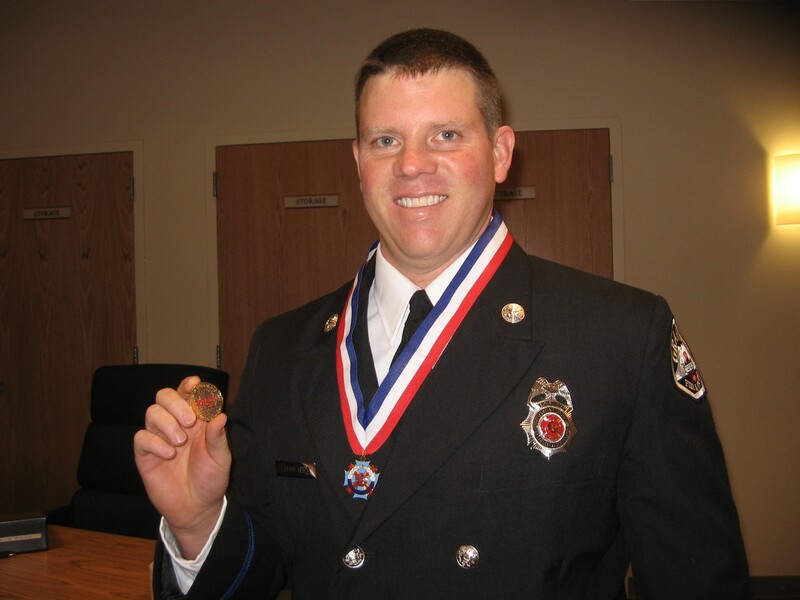 The Graham Fire and Rescue Department lauded one of its own Monday evening when it bestowed its highest award, the Medal of Honor, to fire fighter Aaron Tang for his bravery in rescuing a wheelchair-bound woman from her burning home last September. Tang, a nine-year veteran of the Graham Fire and Rescue, is the first member of the department to receive this distinction. Before a packed Graham Fire HQ station, a group of dignitaries and proud fire chiefs recounted Tang’s heroics. On the evening of September 28, 2010, Tang was off-duty and retrieving his eight year-old son Aiden from school in Puyallup. Driving down Shaw Road towards their home in Graham, Tang spotted smoke emanating from a side-street, and he turned down 17th Ave SE in Puyallup. In the 1700 block, he discovered a residence filled with smoke and flames engulfing the rear of the structure. Tang told the Mountain News that several neighbors had come to the scene also, and one was trying to douse the flames with a garden hose. However, the size of the fire overwhelmed that meager attempt. 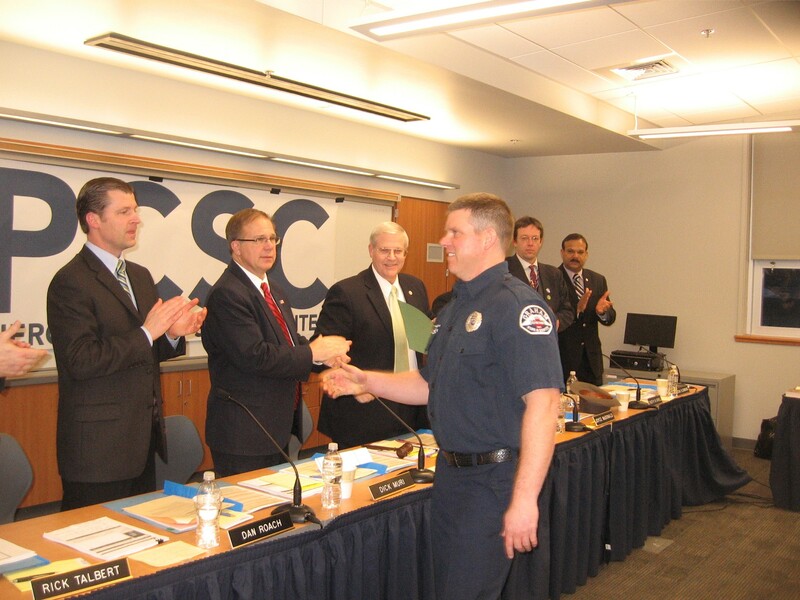 Central Pierce Fire and Rescue Battalion Chief Dennis Lawson praised Tang for his selfless actions. Before CPF&R arrived though, Tang sought to see if anyone was inside the residence; however, he couldn’t see through the windows because of the smoke. Then he tried the front door, but the door knob only moved a fraction of an inch. Nevertheless, he heard sounds within. “That’s when I knew I had to go in,” he told the Mountain News. Without any breathing apparatus or other protective gear, Tang kicked-open the front door and entered into the living room, where he found an elderly woman confined to a wheelchair and wearing an oxygen mask. Tang said that she was conscious, and had only suffered a minor amount of smoke inhalation. However, he acknowledged that the presence of oxygen in those conditions could have been explosive and possibly lethal. In later conversation, Aaron’s wife Lori revealed a note of mystery concerning the event. “He just decided to drive down Shaw for no reason that night,” she said. “Usually, he goes home down Meridian, but that night, for some reason….,” she said, smiling and her eyes glancing upwards. Tang’s mother-in-law, LaVon, shared a similar perspective. 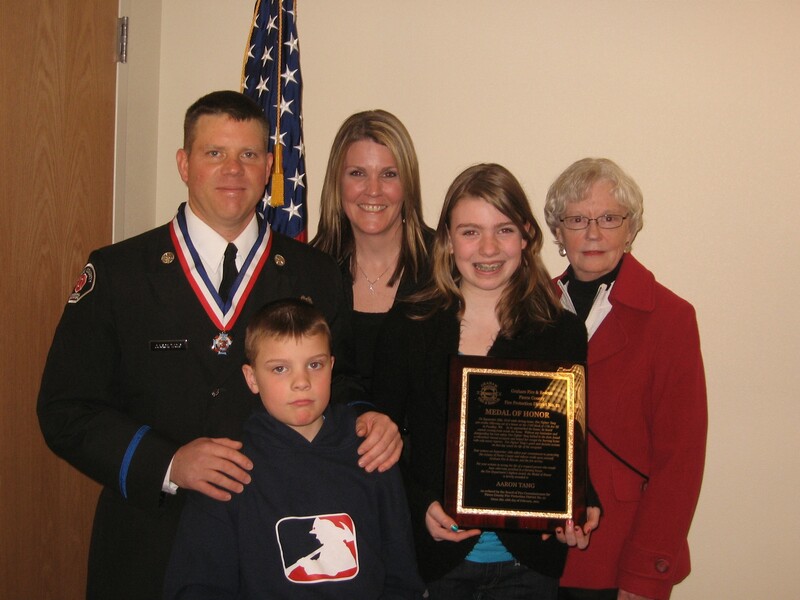 Medal of Honor recipient Aaron Tang stands with his family: wife Lori, mother-in-law LaVon, daughter Dani, and son Aiden. 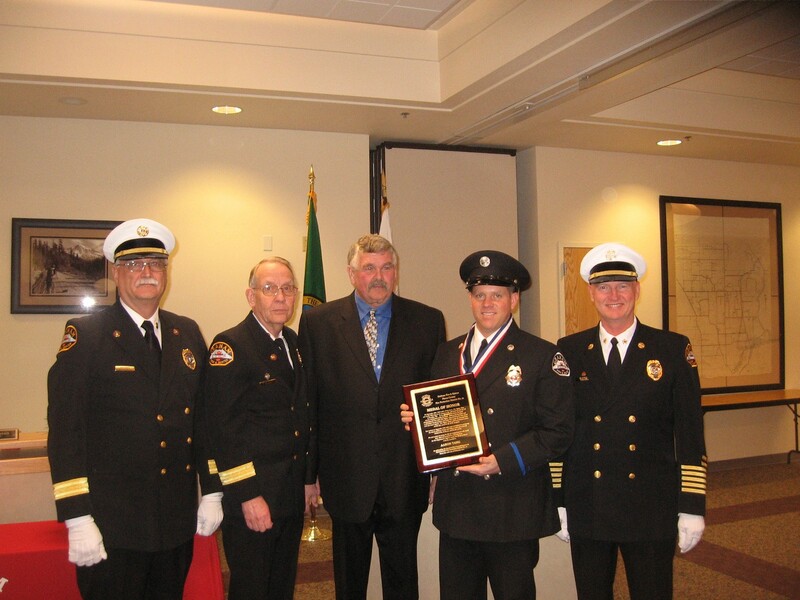 The President of the Washington Fire Chiefs’ Association, Al Church, gave Aaron the highest accolades. In appreciation of Tang’s actions, Chief Church presented Aaron with a Fire Chief’s coin, a special token revered in the brother-and-sisterhood of fire fighters world wide. The tribute evoked “oohs” and “aahs” from the dozens of fire fighters in attendance. Graham Fire Fighter Aaron Tang displays his Fire Chiefs' coin. Pierce County Councilmember Roger Bush (R-3rd District) also lauded Aaron. Bush also read a declaration of appreciation from the Pierce County Council and the People of Pierce County. “We are very grateful to you for standing in the gap for all of us,” Bush concluded. “I’ve been in retirement a long time – 35 years – but occasionally I see an individual who is a real fire fighter,” Nance said, beaming towards Tang, and he continued. “I was a training officer for many years and I always told my trainees, ‘Don’t worry about what you’re doing, just try. Try, try, try; and you did, Aaron. Thank you. What you’ve done – well, I’ve never seen anything like it in all of my years as a fire fighter. Aaron Tang was also honored by the Pierce County Council on Tuesday, at their in-district meeting, held at the Pierce County Skills Center on Canyon Rd. This entry was posted in Graham News, Remarkable men and women and tagged Heros in Graham. Bookmark the permalink. Your story on Fire Fighter Aaron Tang was very well done, complete and touching. Also with quality photographs that enhanced the article.